At 18 a man micturates (that’s pisses to the likes of you) with the power of a fire-fighter’s hose, able to hit the ceiling with a high-pressure jet that could dislodge crockery. Having a bladder of iron, he can drink all he likes without a care in the world and save it up for one almighty outpouring that has the force of Pistyll Rhaeadr and the cubic volume of the Severn Bore – usually behind a tree or up against the wall of a police station. But as he gets older everything changes. By the time he hits 50 he urinates in a sorry dribble, more like a watering-can than a hose and more likely to hit his shoes than the daunting heights of a regulation shitter. Every pint of beer means two trips to the gents, and every night’s sleep is disrupted by the repeated haranguing calls of nature. What was once an unnoticed bodily function becomes a major issue around which the whole day must be planned. Lads, be warned: there’s a new corner of hell waiting for you on the road ahead. 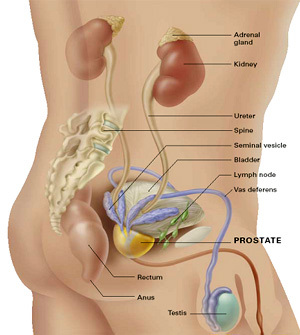 The culprit is the prostate, a gland in male mammals that inevitably grows with age, hence the disruption of urine-flow. After putting up with the, er, inconvenience for a few years I thought I’d better see my Doctor. You never know, it could be prostate cancer, I thought cheerily as I booked the appointment. After an examination and various blood and hormone tests, I went back for the results…dramatic delay to add tension…I’m all clear, it’s just slightly swollen, perfectly normal for my age, I’ve been put on tablets and am noticing the difference already: I’m slashing like a buck stallion and, who knows, one day soon I might rustle up an erection! The next task is to coach one of the girls down the pub to say loudly as I walk in: “Is that an enlarged prostate in your pocket or are you just glad to see me?” That should bring the house down.